Sworn to protect the forest of Mirkwood, Silvan Elves are known to be lethal warriors with an expertise in the use of bows and swords. The Mirkwood Infantry Sword is a stunning display sword designed after a weapon from The Hobbit. 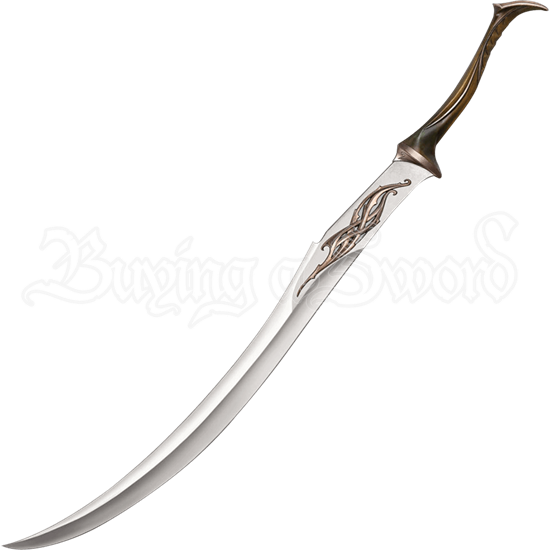 Made from stainless steel, the blade of this impeccable sword features a curved design replicating the exact look of the Silvan swords from the film The Battle of the Five Armies. The base of the blade is decorated with gleaming bronze hued elven accents, while the grip features a curved design as well. Included with this sword are a wooden wall display, mounting hardware, mounting instructions, and a certificate of authenticity. Show that you are prepared to defend the kingdom of Thranduil in your home with the Mirkwood Infantry Sword!